Turkey leave the 2013 EuroBasket Women competition with a bronze medal after beating Serbia (92-71). Turkey finished the competition with 7 victories and 2 defeats. Turkey are the hosts of the 2014 FIBA World Championship for Women. 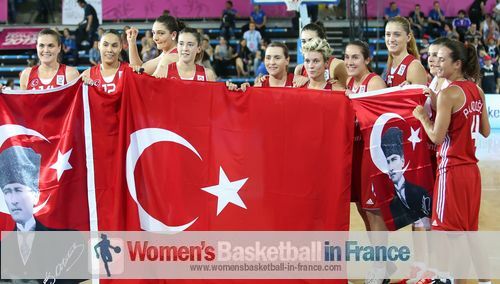 In 2011, Turkey eliminated the 2009 EuroBasket Women Champions France (68-62) in the semi-final. However in their final match they lost to Russia. This time around they lost to France in the semi-final but finished their competition with a victory against Serbia (92-71) for the bronze medal. It was only during the third quarter with Birsel Vardarli exploding with 15 points that Turkey took control of the match for good. Vardarli finished with 17 points and 5 assists. Nevriye Yilmaz led Turkey with 19 points while Quanitra Hollingsworth contributed 18 points. The two teams went on the attack right from the start with no defense on display. In an interesting opening five minutes it was Serbia without Ana Dabovic that led (16-9) after a three-point play by Jelena Milovanovic (2+1). Turkey started to run the floor better and scored on the fast break to reduce the deficit by the end of the first quarter (21-24). 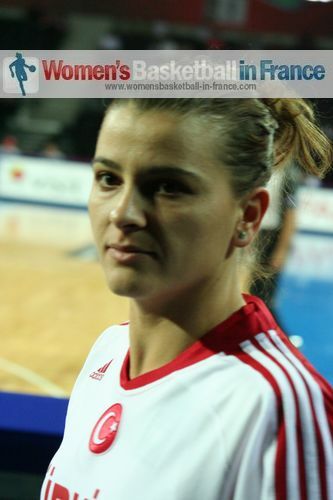 Esmeral Tuncluer from Turkey with 8 points led all scoring while Sara Krnjic fired in 6 points for Serbia. Turkey were back on level terms with a three-pointer by Yasemin Dalgalar with the first attack of the second quarter. Then they went in front for the first time of the match with an "and-1" play by Quanitra Hollingsworth (27-24). Despite missing 6 consecutive shots from beyond the arc, Serbia were not put off and Milovanovic connected for Serbia to go back in front 13 minutes into the game (31-29). Both sides started to play some defense and the match became much more physical. The lead changed hands practically every time somebody scored. Serbia took the advantage (44-43) with 2 points by Tamara Radocaj with the last attack of the quarter. Krnjic and Milovanovic went into the locker room with 11 points each for Serbia while Tuncluer and Nevriye Yilmaz had 12 and 11 points respectively for Turkey. The start of the second half started with a festival of long distance shooting and good point-guard play by Birsel Vardarli (in picture). Vardarli scored 7 points as Turkey opened their first lead of the game (54-49). The Serbian coach, Marina Maljkovic, was forced to call a time-out with just three minutes played in the third quarter. However nothing changed for Serbia. Turkey continued to be aggressive and after 26 minutes the lead grew to double digits (59-49). Turkey were finally in control and with a total of 15 third-quarter points by Vardarli maintained the advantage going into the final quarter (66-56). Turkey were too strong inside the paint and ran over Serbia the rest of the way to win comfortably (92-71).